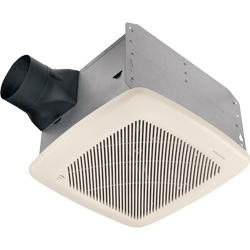 Broan Bathroom Exhaust Ventilation Fans: Broan is North America's largest producer of residential ventilation exhaust fan products such as range hoods, bath fans, ventilation fans and indoor air quality products. Fast FREE Shipping on orders over $79.00. • What does CFM mean? • What is a Sone, and how is it measured? • What is continuous ventilation? 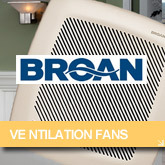 • Can I mount Broan fans above my tub and shower? • Can my ceiling fan be surrounded by insulation? • Will Broan Fans work in wall-mount applications? • Will a ceiling fan or wall-mount utility fan serve as a range hood? • What does "static pressure" mean? • How long should a bath fan run after a shower is used? • What should I do if I can't wait for moisture to clear, but I don't want a fan to run all day long. • What are the timer features? • Where should the exhaust fan be located? • Where is the exhaust outlet on the ventilation fan? • Why do the windows and mirrors fog even when the fan is running? • Why is water dripping from the grille of the fan? • Can I install a heater over the bathtub or in a shower? • Can I use an inline or multi-port fan in one large bathroom? • Does a duct-free bath fan expel air? 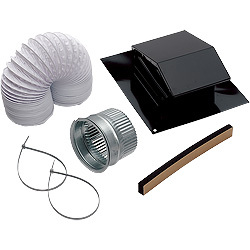 • What type of exhaust fan is recommended for hot tub areas? • Can I use a smaller diameter duct than what the fan is designed for? • Can larger diameter ducting be used with my bath fan? • What type of duct is recommended, rigid or flexible? • Can I exhaust my fan into my attic instead of out the roof or wall? 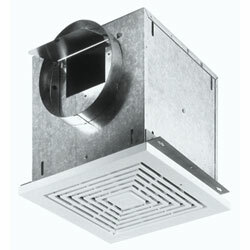 • What type of exhaust fan is best for a sauna or hot tub area? • Can I use a fan in a steam shower? • Can I vent more than one bath fan out of a roof or wall cap? CFM is the acronym for Cubic Feet Per Minute - the measure of air volume moved by the fan blower. Choose a fan with a CFM rating appropriate for your room size to ensure adequate ventilation. What is a Sone, and how is it measured? A Sone is a measurement of sound in terms of comfortable hearing level for an average listener. The lower the sone value, the more comfortable the listening environment. Sones are not decibels or volume, but rather how sound is "sensed". One sone is the equivalent of a quiet refrigerator. Continuous ventilation provides today?s airtight homes with a relatively constant and controlled lower level of ventilation. Broan's extremely quiet and efficient QT Series is ideally suited for these applications. Can I mount Broan fans above my tub and shower? Most Broan fans are rated for use over a shower or bathtub with a GFCI (Ground Fault Circuit Interrupter). Can my ceiling fan be surrounded by insulation? Yes. Broan bath fans are designed to provide adequate cooling for motors and lighting, as well as products with integral heaters. 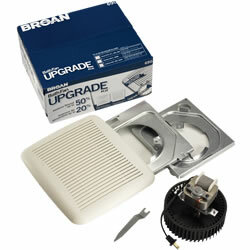 Will Broan Fans work in wall-mount applications? Some Broan bath and utility fans may be wall mounted. See the spec matrix for specific models. 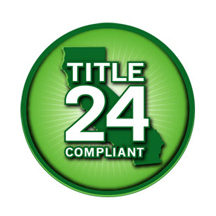 Improper installation may affect fan life, safety and your warranty. Will a ceiling fan or wall-mount utility fan serve as a range hood? No. Range hoods are specifically designed to handle grease and high temperature environments.Ventilation provided by NuTone fans is only a supplement for odor and moisture removal in the kitchen. What does "static pressure" mean? Static pressure is the measurement of airflow resistance as it is pushed through ductwork which reduces the effectiveness of the fan. Learn more on the Home Ventilation Institute web site www.hvi.org. How long should a bath fan run after a shower is used? The Home Ventilation Institute recommends that a fan should be left on for 20 minutes more to clear humidity adequately and to ensure moisture and condensation in the fan body or ducting is minimized. What should I do if I can't wait for moisture to clear, but I don't want a fan to run all day long. Broan has sensing fans that detect the humidity rise caused by a shower and turn on automatically, when moisture has cleared it turns off. Some wall controls also give you the option of humidity sensing, or timer control. Just set it and forget it. What are the timer features? Delay-off timers automatically shut your fan off after a specified time interval. It?s a nice feature in high traffic bathrooms where you may wish to let the fan run to clear moisture adequately. A timer counts down the minutes of fan operation selected by the user. Where should the exhaust fan be located? 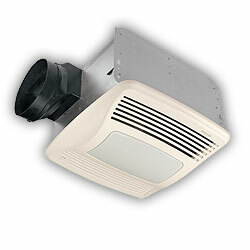 Exhaust fans should be located in or near the shower or tub, and in an enclosed water closet. Keep exhaust points opposite the supply air source to ensure that the fresh air is drawn through the room. Bathroom doors should not be sealed too tightly at the bottom in order to allow "makeup air" to enter the room when the door is closed. Where is the exhaust outlet on the ventilation fan? The exhaust outlet is the point where air is discharged through the body of the fan housing into the ductwork. During installation, orient your fan with the exhaust outlet pointing toward the exit vent on your roof or wall to minimize turns in ductwork that impede airflow. Why do the windows and mirrors fog even when the fan is running? If windows and mirrors are very cold, condensation can still form on these surfaces. And if your bathroom is sealed tightly, replacement air may not be entering the room fast enough to displace the moist air. Be sure to undercut your door sufficiently to draw fresh air into the room. Fan placement can also be a factor. Your fan should be located far from the replacement air source to ensure the moist air is drawn out first. Finally, too many twists and turns in the ducting will significantly reduce the ability of the blower to remove moist air. Make sure your ductwork is as short and straight as it can be, with gradual turns rather than tight corners where necessary. Why is water dripping from the grille of the fan? Dripping water is either condensation (usually due to cold ductwork or improper duct installation), or a problem with the seal on a wall or roof vent. Insulated ductwork can help solve condensation problems, and running the fan longer will ensure moisture is completely removed from the duct. Ductwork should slope down toward a wall vent to direct condensation out of the exterior vent opening rather than back into the fan housing. Can I install a heater over the bathtub or in a shower? No. Heaters are not UL Listed (Underwriter's Laboratory) for installation over a bathtub or in a shower. Can I use an inline or multi-port fan in one large bathroom? Yes, this works the best for large rooms because you can install the ports over the areas where the ventilation is needed the most (source control). The size of the multi-port would be determined by the size of the room. Does a duct-free bath fan expel air? No. A duct-free fan is not a ventilating device. It does not remove air from the room. What type of exhaust fan is recommended for hot tub areas? A high CFM rated device is normally recommended for this type of application. Can I use a smaller diameter duct than what the fan is designed for? This is not recommended. It will cause the fan to run harder, greatly reducing the CFM performance of the fan and create excess noise. Can larger diameter ducting be used with my bath fan? Yes, larger diameters will result in improved performance. What type of duct is recommended, rigid or flexible? It is recommended, where possible, to use rigid duct. 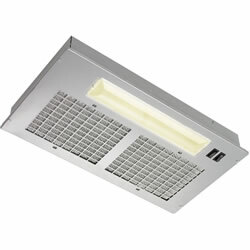 It has less resistance to air flow and allows the fan to operate much more efficiently. If flexible duct is used, be sure the duct is as straight as possible. Can I exhaust my fan into my attic instead of out the roof or wall? 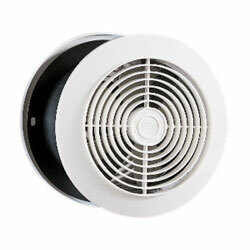 Never exhaust air into spaces within walls, ceilings, attics, crawl spaces or garages. The humidity may damage the structure and insulation. What type of exhaust fan is best for a sauna or hot tub area? High CFM-rated devices are normally recommended for this type of application. Can I use a fan in a steam shower? No. Since these are normally sealed chambers, a vacuum will be created. Can I vent more than one bath fan out of a roof or wall cap? No. Always follow the manufacturer's recommended ventilation requirements. 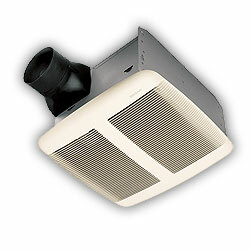 Wave Plumbing is an authorized reseller of Panasonic, Fantech, S&P Soler & Palau, Broan & NuTone Bathroom Ventilation Fans. The website ventilation-fans.com is operated by Wave Plumbing. The lowest prices and fast Free Shipping. The most knowledgable sales staff with years of ventilation experience. The top brands in ventilation: Fantech, Panasonic, Soler & Palau, Broan, Nutone. Same Day - Fast Free Shipping!